Manipulist is powerful & Free Web-based text and list manipulator & scraper in 3 easy steps. The digital world is mainly based on text files. On the other hand, repetitive tasks involving the manipulation of text and lists can be still very time consuming. Programmers generally use their own scripts, but what for the rest of the world? Billions of people use Office packages or other text editors, but when it comes to manipulating lists, still these software offer the possibility to provide a single action per time. 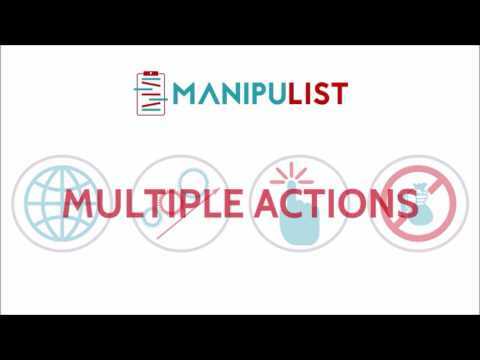 Manipulist allows you to manipulate text and lists in a more productive way, by giving the opportunity to apply multiple actions to the same input text at the same time. Only 3 simple steps are required: 1) type/copy text or load a text file; 2) apply as many actions as desired: sorting, removing, replacing, scraping email or websites or data, shuffle, count, and more... then run the task; 3) check the new modified text file, then copy it to clipboard or export it to file. Manipulist runs on all major browsers, allows social login and is FREE as free beer.